This conversation is sponsored by Silk. As always, the opinions and text are all mine. 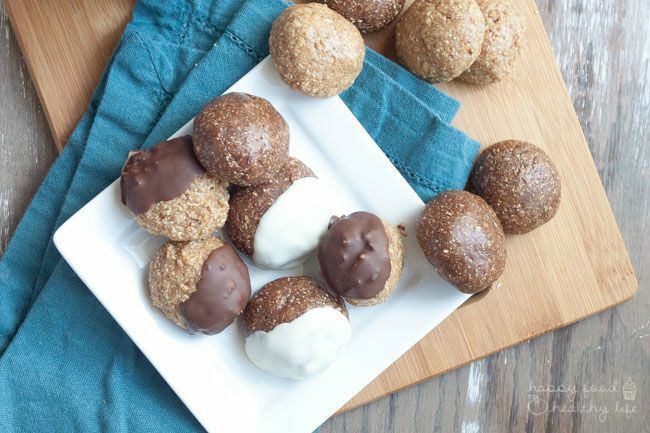 Whether you’re team vanilla or team chocolate, you are going to love everything about these healthy protein bites. And they’re 100% no-bake, which makes them totally do-able all year round! I’ve tried making it myself. I’ve tried buying all different versions. I’ve tried bribery. I’ve tried sneaky tactics. But nothing has worked… until now! 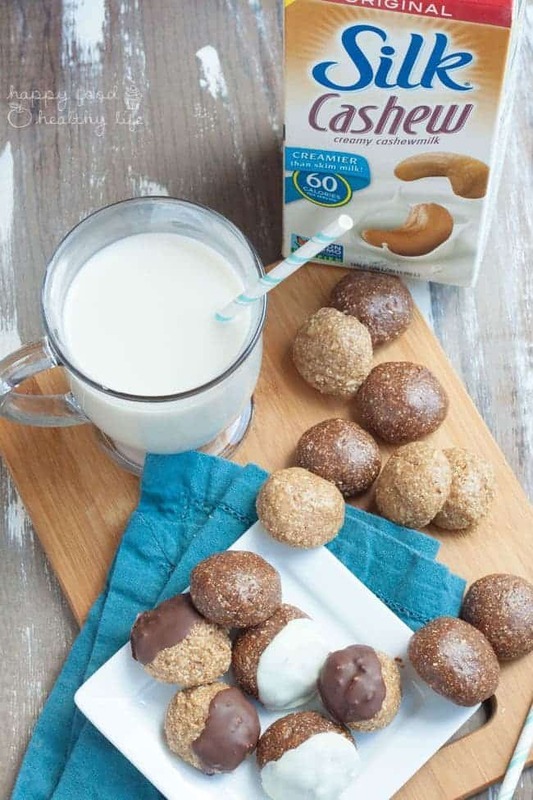 Dairy-free milks. Almond milk, oat milk, hazelnut milk, cashew milk, rice milk. All of it. Personally, I can’t get enough of them and can’t remember the last time I actually had a glass of cow’s milk. But my kiddo… that’s a different story. For awhile there, we were having to try a diet for him that included very little dairy as we were trying to figure out what triggered his asthma/allergies. But none of the options were tolerable to him. He pretty much choked down the rice milk though for our month-long experiment. Thankfully, we don’t have to go completely dairy-free for him, but I do still try to limit dairy to a minimum. He already drinks cow’s milk at breakfast. Yogurts throughout the day. I wanted to be able to come up with other milk options without him gagging through it. Good news – we have a solution now! The first time I pulled it out of the fridge, I made sure he wasn’t looking. I poured the chocolate-y richness into a glass and hurried to shove the carton, that clearly read “Cashew” on the front, back into the fridge before he could figure out what I was up to. “Buddy – I have a drink for you!” I called to him. As soon as he came into the kitchen and saw that it was chocolate, he was thrilled. Never do I ever serve chocolate milk in our house, so this was a definite treat, and he was ready to guzzle it down. And that he did. Gulp gulp gulp until he slammed it down on the counter. Lots of Mmmms as well. I was so thrilled to see that they came up with the Original Cashew Milk, so my mind was totally blown when I heard chocolate and vanilla versions were on the horizon as well. I don’t know if you saw, but I asked on Facebook if they’re on team vanilla or team chocolate, and I have to say that everyone was pretty dang opinionated. And also that you are chocoholics like me! 80% of you can’t get enough chocolate, and the other 20% of you are loving vanilla. So when it came time to highlight both the chocolate and vanilla cashew milk, I knew I wouldn’t quite be able to make up my mind – so I picked both. One recipe with two options. And you won’t believe just how simple this recipe is. 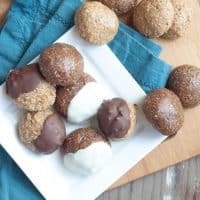 I actually was inspired by my favorite Aussie-now-US-blogger, Arman of The Big Man’s World, who makes some of the best healthy no-bake treats ever! (This one in particular is calling my name!!) It only took me about 5-10 minutes to make the whole recipe come together. No but really, I need to know – are you team chocolate or team vanilla?? Tell me in the comments! Also, make sure you grab a Silk coupon so you can try either vanilla or chocolate yourself! 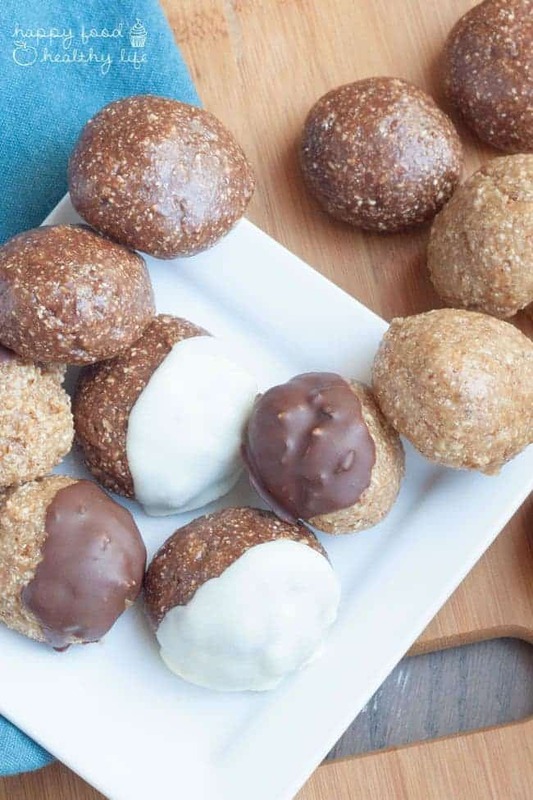 Regardless of which type of bites you are going to make, begin my combining the dry ingredients together in a bowl, oat flour, protein powder, and cocoa powder if you're making chocolate bites. Then add the almond butter and start incorporating that with a fork, so it "mooshes" together easier. Then add the milk. For the chocolate version, because there is the added cocoa powder, you may need to add slightly more milk. Mix all ingredients together with the fork until everything is incorporated. The dough will be sticky and very thick. Roll Tablespoonfuls of dough between your palms and place on a parchment-paper lined baking sheet. Like I said, the dough will be very sticky, but wetting your hands often will keep the dough from sticking to your hands. Once all the dough has been rolled into balls, place in the refrigerator for at least an hour before covering in chocolate, if you desire. 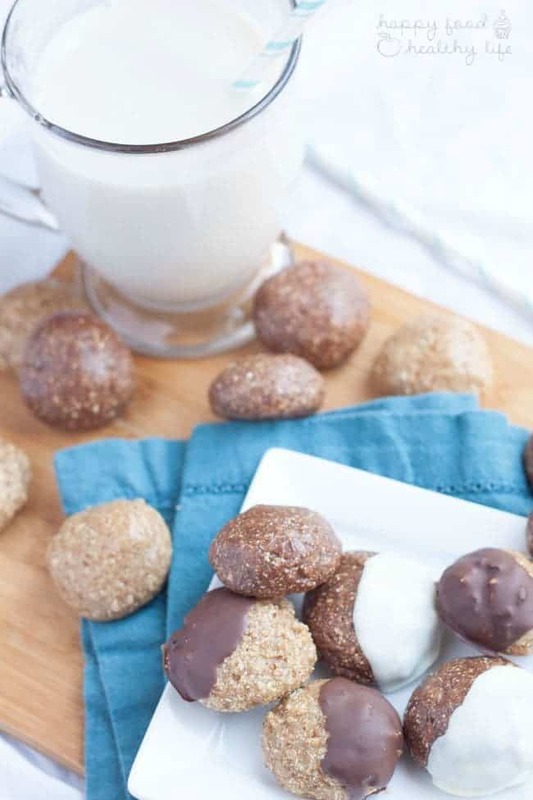 Once you're ready to cover in chocolate, place a Tablespoon of chocolate chips (white or semi-sweet) in a small microwavable bowl with a teaspoon of coconut oil. Heat for 5-10 seconds at a time, stirring in between each interval, until the chocolate is melted completely. Spoon a small amount over each cookie dough bite and place baking sheet back in the refrigerator. This will cause the chocolate coating to harden. Once hardened, you can then transfer the bites to an air-tight container. But be careful if you need to stack them. They continue to stay sticky on the bottom, so you'll need to layer parchment paper in between. Will keep in a container for up to a week in the refrigerator. Um..team vanilla all the way! How addictive are they? totally ‘eat the whole batch’ worthy! Yum! Totally going to make these! Thanks for posting! Do you think it’ll work with the unsweetened cashew milk instead? And without coconut oil? So glad you’re going to try these out! 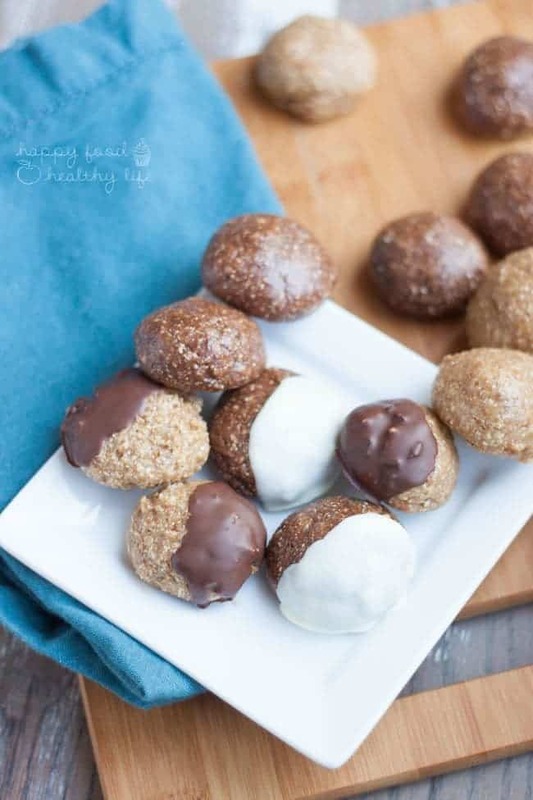 If you’re going to omit the coconut oil, the chocolate you dip the bites into probably won’t harden up and will be really melty and messy. And you may want to add a little agave if you’re going to use unsweetened milk. Let me know how it works out for you!